ORLANDO, FLORIDA – MARCH 29, 2016 – Cultists representing independent presidential candidate Cthulhu will be marching, slowly, in the April 1, Spooky Empire Zombie Walk in Orlando. The March 15th primary may be over, but the resulting despair still lingers over many Floridians. Dread Cthulhu, High Priest of the Great Old Ones and a God in his own right, has taken notice and has directed his Floridian cults to add to the misery. Cthulhu was described by prophet (and author) H.P. Lovecraft as an alien god whose appearance is a mixture of giant octopus, humanoid, and a dragon. He stalked the Earth when our world was young. Now He is running for president. 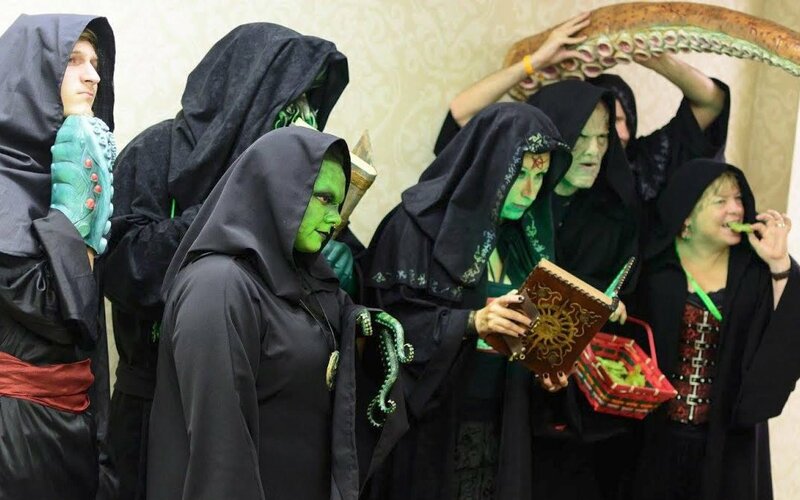 To educate voters and herald Cthulhu’s impending reign, Floridian cultists have coordinated with the national campaign, Cthulhu for America (cthulhuforamerica.com), to march at Spooky Empire Retro, a horror convention held in Orlando, Florida. “It is in the cult grassroots where we find the greatest fervor for this election. Their excitement is contagious and we see it every night at events throughout the nation. There is nothing more inspiring than their bloodcurdling ululations of devotion at our rallies,” said Samir al-Azrad, press secretary for the Cthulhu campaign. On April 1st a Zombie Walk will be held to kick off Spooky Empire Retro, held at the Wyndham Orlando Resort. Loyal cultists will be taking the opportunity to march with signs, chant, hand out flyers, and spread the word on candidate Cthulhu’s stance on immigration, the economy, and foreign policy. The Spooky Empire Zombie Walk will be held at 4 PM on April 1st, and will start at Pizzeria Uno at 8250 International Dr, Orlando, Florida 32819. The Zombie Walk is free and open to the public. Tickets to the Spooky Empire Retro convention can be purchased at www.spookyempire.com or on site. The Floridian Cthulhu Cultists can be found roaming various horror-themed events throughout the state, spreading the unspeakable word of Cthulhu, and handing out delicious cookies in His likeness. All with dark robes, free and empty minds, and a wish to be eaten first are welcome.